Join Winnie the Pooh and friends for this character buffet. Disney World guests of all ages will love the chance to interact with characters from Winnie the Pooh at Crystal Palace. Located at the end of Main Street to the left as you head toward Cinderella Castle, Crystal Palace offers a buffet of American fare, open for breakfast, lunch, and dinner. The offerings here do change quite often. If your child loves Winnie the Pooh and all his friends from the Hundred Acre Wood, this will be a great opportunity for character interaction. This is the only Winnie the Pooh themed character meal at Walt Disney World. Check out Guide2WDW User Reviews of Crystal Palace. Winnie the Pooh and Friends invite you to indulge yourself in our bountiful buffet. The room comes alive with the sights and smells of the day’s offerings being prepared in our live on-stage kitchen. Note: Prices tend to vary based on when you go. The prices listed below are a close estimate. One table service entitlement for Disney Dining Plan guests. Note: Menus for Disney World restaurants change on a somewhat regular basis, so the menu listed above is subject to change. 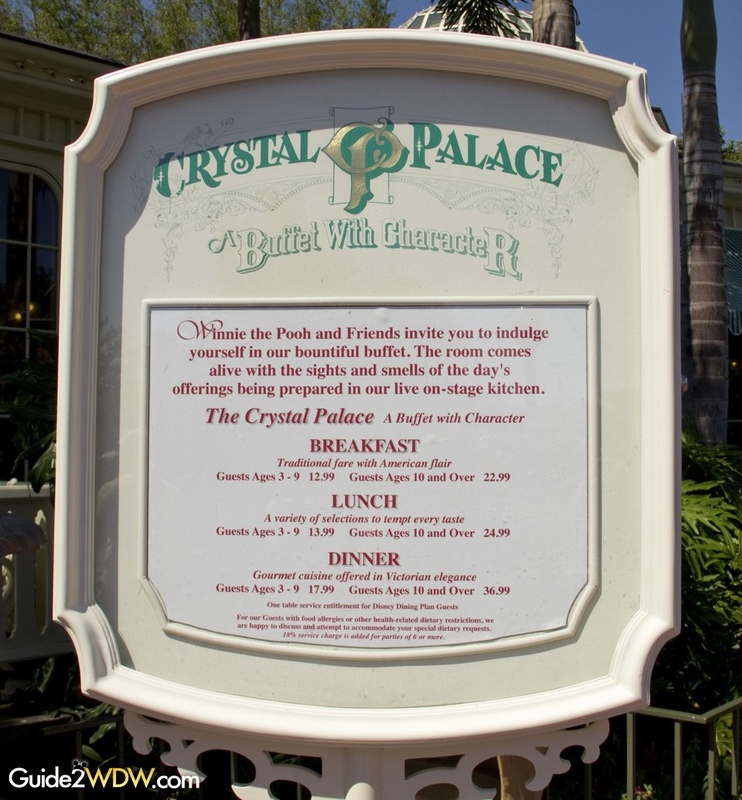 For the most up to date menu, check out Disney’s official Crystal Palace menu.